03 Dec 2018 --- Active lifestyle demands continue to dominate the R&D efforts of the industry’s key players. At this year’s Health Ingredients Europe (HiE) in Frankfurt, Germany, Beneo sought to demonstrate how the industry can create innovative, sportified food and beverage products that are relevant and appealing to mainstream consumers. At the show, the company highlighted the myriad possibilities for NPD featuring its range of functional ingredients. With a 29 percent increase in the number of product launches carrying some kind of sports claim over the past two years, many manufacturers are making moves to help consumers meet their increasing desire to lead healthier, more active lives, the company reports. “The particular challenge is that sportified products should be for everybody, not just for athletes. Our focus on sportified products for mainstream consumers has shone the light on the growth potential available to manufacturers who are prepared to be innovative. As more products become available to mainstream consumers, the sports market is forecast to reach more than €15 billion in 2021, presenting a significant growth opportunity for food and drink manufacturers around the world,” says Thomas Schmidt, Marketing Director at Beneo. 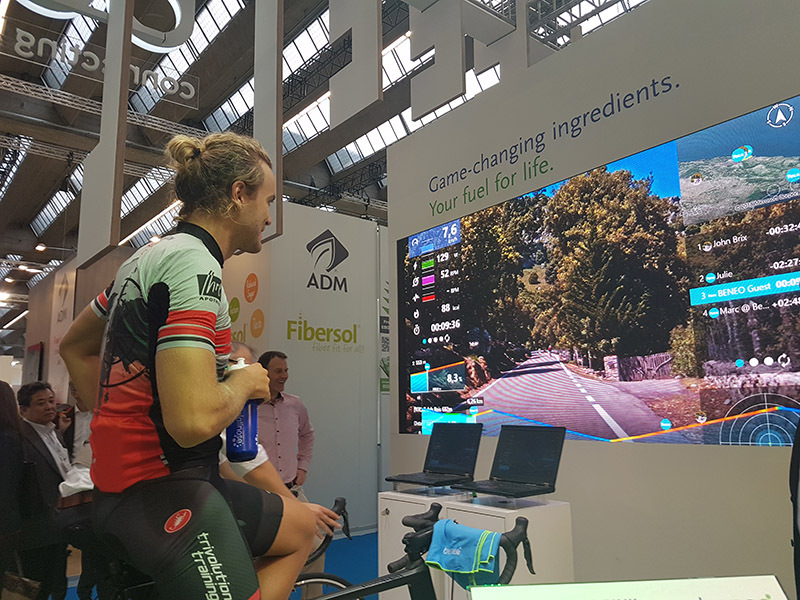 Click to EnlargeVisitors at HiE could test their stamina by racing against triathlete Marc Rink at the Beneo booth.Active consumers want products that help them to look and feel good, manage their busy day and maintain a healthier weight. This means that blood sugar management, sustained energy and the fat burning impact are of great importance to them. However, the current sports and fitness-related products offered on the market often contain “fast carbohydrates” such as maltodextrin, glucose syrup and sucrose, which release glucose into the bloodstream very quickly and generally suppress fat oxidation, the company notes. These high-glycemic carbohydrates are not ideal for consumers looking for endurance in their training, for day-to-day sports activities, or for achieving balanced energy levels throughout the day. Speaking to NutritionInsight at the show, Dominique Speleers, Executive Board Member for Sales and Marketing at Beneo, explains that the modern, active consumer is increasingly seeking to emulate professional athletes in terms of nutrition and lifestyle, becoming increasingly interested in the science behind food and beverage offerings. “In sportification, Beneo observes that more people are seeking a very active lifestyle, which is closer to sports or at least that's the impression people have. So they want to imitate what athletes are doing. Sports people know how important it is to have a continuous supply of energy. In this case, a balanced glucose supply to keep your brain and body going,” he says. Click to EnlargeBeneo’s Palatinose acts as a necessary energy source for the body during activity. As this carbohydrate is fully, yet slowly released, it provides glucose (the most effective source of energy for the human body) in a sustained manner. This ensures blood sugar levels stay balanced, which helps to support an improved fat burning rate. “The main applications for Palatinose are drinks and sports gels and everything that is easy to consume on the go, but it can be incorporated in many applications including breakfast cereals or cookies. The variety is big, but we see more and more beverages are incorporating it,” he notes. HiE visitors could compete or ride alongside professional triathlete, Marc Rink. At Beneo’s stand, Rink demonstrated the endurance potential of Palatinose, as he cycled throughout the event. 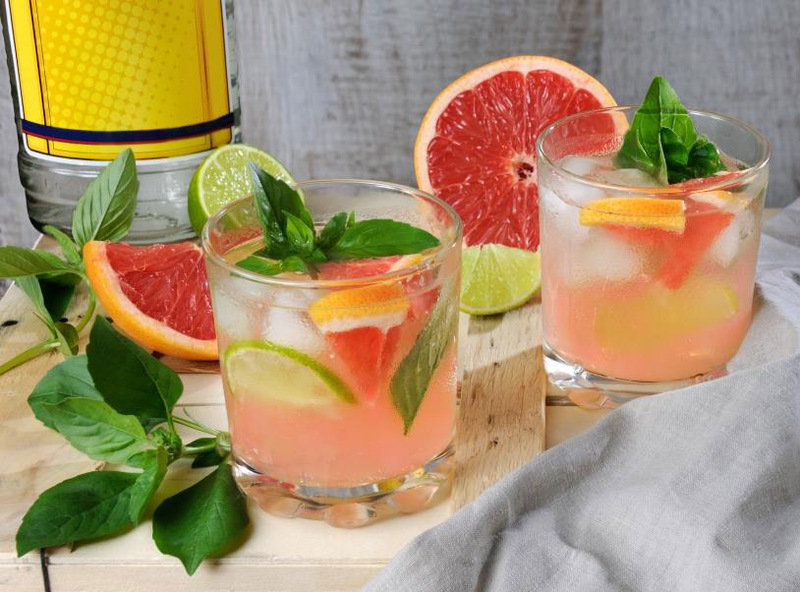 • An energizing pink grapefruit-flavored water containing Palatinose, providing hydration and healthy blood sugar levels at the same time. • A breakfast almond chocolate drink with a velvety mouth-feel that is high in fiber and induces a healthy blood glucose response due to Palatinose and the chicory fiberOrafti Inulin. • A creamy and indulgent, dairy-free vanilla pudding with rice flour, rice syrup, rice starch and Palatinose, that supports balanced blood sugar levels. Prebiotics are well represented in Beneo’s portfolio and the company tips this area as particularly fertile for further R&D as consumer interest in gut health continues. Beyond gut health, the company believes there are growing opportunities in immunity related to prebiotics, with Speelers highlighting Beneo’s continued commitment to advancing research into this area and prebiotics as a whole. Beneo offers naturally-sourced, functional ingredients derived from the chicory root, sugar beet, rice, and wheat, adding nutritional, technical and health benefits. Our portfolio offers an opportunity to create all-natural, non-GMO or organic products that are non-cariogenic, gluten and lactose-free, fiber-enriched, fat and sugar reduced, easily digested, energy sustaining and calorie smart, as well as supportive of fat oxidation – all without compromising taste, texture or mouthfeel. Our ingredients can be used in applications like dairy, confectionery, bakery, cereals, soups & sauces, meat & vegetables, baby food, and beverages. Formed by a merger of the companies Orafti, Palatinit and Remy in 2007, Beneo is a 100 percent subsidiary of the Südzucker Group and has over 100 years experience with functional ingredients. Through a unique chain of expertise, including Beneo-Institute and Beneo-Technology Center, the company supports customers throughout the entire product development process: ranging from new product ideas and concept development based on consumer insights and market research to nutritional science by providing regulatory advice and facilitating the formulation of successful products. Functional fibres: Orafti® inulin and oligofructose are prebiotic fibers extracted from the chicory root. These fibers do not only promote optimal intestinal functioning but also act as prebiotics that promotes the growth of ‘good’ bacteria (Inulin: EFSA claim on prebiotic wellbeing available). Both ingredients allow for an EFSA claim on blood sugar management as they support a lower rise in blood glucose levels and a lower insulin response. Functional carbohydrates: Palatinose™ or isomaltulose is a low-glycaemic and fully-digestible carbohydrate derived from the chicory root. What is special in comparison to other carbohydrates is that it releases its full carbohydrate energy (4kcal/g) more slowly and in a more balanced way (EFSA claim available). It improves fat oxidation during physical activity, leading to a sustained energy supply. Being acid stable, the food maintains its osmolality – an advantage, especially in sports beverages. In addition, it is a non-cariogenic ingredient. Functional protein: Beneo’s Vital Wheat Gluten is a source of essential amino acids which the body cannot produce itself. Apart from their nutritious benefits, they improve the taste and texture of bakery goods, ready-to-eat meals, meat-based products, etc. Consequently, the sustainable sources of BeneoPro VWG have been allocated the IFS label, an acknowledged reference for high-quality ingredients. Specialty rice ingredients: Beneo’s natural and organic rice ingredients include flours, starches, bran, syrups, proteins and concentrates. They help you respond to the growing demand for clean label, organic, gluten-free and hypoallergenic products. In addition, they improve mouthfeel, texture, crispness, crunchiness, shelf-life, and color of products.